I was all ready to do a review of Avengers Assemble! when the boy noticed The Super Hero Squad Show on Netflix, and he hasn’t watched an episode of anything else since. There were only two seasons of this show for some reason, and both seasons are on Netflix. I think we’ve watched everything at least once by now. This is actually a pretty good show, believe it or not. The premise: There are two cities, Super Hero City and what I believe is called Villainville, and they’re separated by a giant wall. All the people and all the superheroes live in Super Hero City, and the villains do villain stuff so that the heroes have to fight them. The first season is obsessed with finding and controlling little broken bits of a magic sword and the second season is all about what happens when the sword gets put together and is a lot more cosmic in tone. The cool thing about Avengers Assemble! was how seriously it took itself– and there’s a pretty good chance that I’ll still be writing a piece on that show soon enough. 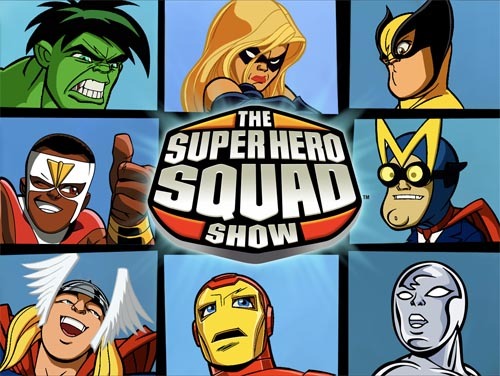 The Super Hero Squad Show takes absolutely nothing seriously, and that’s the genius of the show, because it knows it’s goofy as hell and runs with it. Particularly fun are the portrayals of Captain America and Thor; Cap (who is a side character, surprisingly) is convinced he’s still in the 1940s and talks like a dad from a sitcom from that era, and Thor has the Norse nonsense turned up to 12– the episode from Season 2 where Beta Ray Bill is introduced is especially funny. Hulk calls the Falcon “Bird,” which absolutely never ever stops being funny. My one beef with the show? It occasionally kinda treats its female characters like crap, and flat-out sexual harassment is a bit more of a theme than it ought to be, in that sexual harassment is a thing that happens and it shouldn’t ever be. There’s a bit where Mr. Fantastic is proud of Ms. Marvel for having a good idea and he kisses her on the cheek as a reward. It doesn’t surface all that often but when it does it’s really jarring and annoying, and Ms. Marvel is frequently a part of it; she’s frequently portrayed as a ditzy girl and it’s really obnoxious. She ought to be Captain Marvel anyway, dangit. This looks hilarious, I may have to check it out. Amen to your last point, though. I am so watching this with M as soon as we are done with Deathnote. The picture of Silver Surfer on the bottom right has me cracking up for some reason. Thanks for the idea! The Surfer is ACTUALLY VOICED AS A SURFER DUDE. It’s hilarious.